We love innovative people and the companies they create. Here’s a company we think you’ll appreciate, especially if you’re living green and are eco-minded: Babysoy. 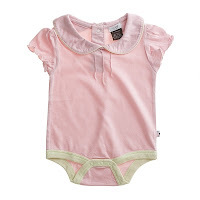 Babysoy offers the ultimate in eco-friendly fashions for babies! Soybean fiber is being called “vegetable cashmere” as it has an incredible soft-to-hand feel. The fiber contains 18 amino acids and is luxurious and soft as well as extremely durable. From onesies to two piece outfits, these soybean baby clothes provide excellent wet permeability and heat retention – keeping babies warmer and drier. On the Web: www.babysoyusa.com.